There was a village that had a lodge in which ten brothers lived, two of whom were too young to hunt. The older of the two boys was no longer a toddler, but the smallest was too young to dress himself. The little boy was very mischievous and loved to give war whoops. He owned a ball made from raccoon fur with the tail still attached to it which he would noisily throw about. In the evening when the brothers returned from the hunt, they found that the second oldest brother was missing. While it was still light they picked up his tracks and discovered that he had been following a giant otter. The next day a couple of the brothers went out to find what had happened to him, but they too disappeared. After that, a few brothers at a time went looking for the lost men, until finally only the oldest and the two youngest remained. Kunu ("Eldest Born") decided that he would have to go out looking for the lost brothers, despite the young age of his remaining two brothers. He reckoned that there was enough food on the meat racks to nourish the children until the elder was big enough to hunt for himself. Kunu set out, but never returned. So the bigger of the two children decided that he must follow after Kunu to find out what had happened to him. The youngest child insisted on coming along, and wore a white deerskin wrap with the fur on the outside, and brought with him his raccoon tailed ball. Finally they arrived at the shore of the ocean where they came to a lodge. When they entered they found another small boy and his grandmother. She knew who they were, and told them, "Giant dogs have packed off your brothers. Kunu along with many other people is being held prisoner in a long lodge. All of these people are being starved to death, and when you have starved, they feed your body to the dogs. If you want to live, you had better leave as soon as you can, for now is about the time that they usually come." No sooner had she warned them, than they heard a bark so loud that it caused the earth to tremble. The dog bit the reeds that made up the old woman's lodge and began to tear out chunks. Someone came up and said aloud, "When my dog acts like this it is because he has seen something." The smallest boy sauntered outside and said, "Say, don't you have any sense? Can't you see that an old woman lives here in poverty and your dog is tearing up her home? Why don't you call your dog off?" "Well," replied the man, "why don't you do something, then?" As the boy approached, the dog was about to jump on him. Just then the little child took his toy by its tail and gave the dog such a whack that he drove him into the ground so only his tail showed above it. This alarmed the man, who said, "How about pulling my dog up from the ground?" The boy replied sarcastically, "Why don't you?" So the man gave it a try, but could not budge the animal. "How about if I give this a try?" said the boy as he picked up his ball and tail. At the mere thought of this, the dog pulled himself out of the ground and took off running. The man said to the boy, "Why don't you come with me to my lodge? There you will find your brother Kunu." He hoped to add the boy to his collection of prisoners. The dog stayed well clear of the boy as they walked to the man's boat. It was only with great effort that he could get his dog into the same boat with the boy, and then the dog cowered at the opposite end of the boat. They were traveling in a metal boat, and whenever the man wanted it to speed up, he would merely knock on its side. Consequently, they got to their destination in no time at all. The dog did not wait for the boat to land, and jumped right into the water to get to shore all the faster. There were three other giants dogs who began to bark ferociously, but when the fourth dog came up from the water and told them what had happened to him, all four of them disappeared over the hill, running for their lives. There were two structures there: an oval lodge and a long lodge. The boy went to the long lodge and found that it was full of people including his oldest brother, who was the only one still active. The rest of the people had been starved to the point where some could do no more than breathe. Kunu was not pleased to see his brother. "Why have you come here?" he asked. "We are being starved, and when anyone ventures outside, he is eaten by one of the giant dogs. So we were afraid to leave." The little brother said, "I wonder why? The dogs seemed rather timid to me." The boy then went over to the oval lodge. And there inside, unexpectedly, was a beautiful young woman. She asked him, "What do you want?" He replied, "All I want is a single grain of corn, and some utensils for cooking and eating." From this single kernel he fed the people a corn broth, and they began to feel better. The next time he went to the oval lodge, he was alone with the girl again. He told her, "I am going to have to kill your parents and their dogs. I will spare you, but you must give me whatever I ask for." She agreed to this and said, "It is well that you are going to kill them, for they were doing wrong. I told them this, but they paid no attention to me." This time the boy took one kernel of corn and one jerky stick of meat. He went back and put them both in a boiling pot of water, and when it was done cooking, there was enough to feed everyone. They all felt well now, and Kunu asked the boy for a smoke. He produced enough pipes and tobacco for everyone from just one pipe and one pouch of tobacco. The boy assured the people that it was now safe to go outside, so they all left the lodge. The boy now ordered the man around, and told him to go get his dogs. When the man returned with his four dogs, the boy killed them as well as the old man by knocking them into the ground with his ball. He then took their bodies and burned them to ash. All the people headed for the boat, but it was far too small to carry everyone. But the boy said to it, "Get bigger," and it grew to a size that could accommodate all the people. When the boat was loaded, the boy merely knocked on it and it traveled faster. Soon they were at the shore. The people wanted to live together and make the little boy their chief, but he told them that they must return to the many places from which they had been taken. Commentary. As comets retreat from the earth, they become fainter and fainter. Thus to purely visual astronomy, it appears that comets waste away or "starve." The same is true of meteors which dissolve in the atmosphere, albeit at a very fast rate. Comets and meteors appear to be very small when seen in the sky, but very large when they strike the earth. Thus Wojijéga is a small boy with immense powers, especially the power to expand things. Indeed meteorites exhibit the greatest of all forms of both compaction and expansion simultaneously: impact explosion. The meteorite is analogized to a kernel of corn that can feed a multitude: just as an entire plant is compacted somehow into a single seed, so the beneficent powers of the meteor are compacted within it. Just as a single fire can light many pipes, so the flaming stone meteor can light many fires and seed the biota with its powers. The meteor is not only stone like the smoking pipe, but metal like the boat that possesses the power to expand and to accelerate. For the ocean boat it is the loud knock that makes it accelerate, an inverse image of the meteorite, a celestial metal "boat" that makes a loud noise from metallic collision as a result of its acceleration. The people whom he restored to health and who would have made him their chief, are like the meteor showers in which the members of the group are scattered in every direction rather than forming a "village." The Hočągara believe that Wojijéga governs animals, and that his passage over or into the earth causes the generation of game in abundance. Just as his approach towards earth is the opposite of withholding food, so his retreat is starvation. We see this in the starvation experienced by the people in Wojijéga's lodge. A meteor or comet as it descends to the earth becomes like another sun, not merely in lighting up the sky, but in its powers of fecundity. Thus the comet is not a sign of foreboding as in Europe, but carries with it many of the positive powers of the sun. The name wojijé itself means "he who has become a luminary" (< wi-ho-jije).2 The immense powers of fertility possessed by the wojijé stands in opposition to the lunar powers associated with the infertile period of the menstrual cycle. This is expressed in the waning cycle of the moon, and in the lunar predators of the canine genus. 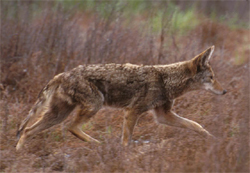 Dogs and coyotes eat what the comet or meteor creates for the benefit of man and therefore are opposed to him. Links: The Meteor Spirit, Celestial Spirits, Coyote, Otters, Raccoons, Wolf & Dog Spirits, The Redhorn Panel of Picture Cave. An American Star Map. Stories: featuring Wojijéga (the Meteor Spirit) as a character: The Meteor Spirit and the Origin of Wampum, The Roaster, The Raccoon Coat, The Green Man; about stars and other celestial bodies: The Dipper, Įčorúšika and His Brothers, The Seven Maidens, Morning Star and His Friend, Little Human Head, Turtle and the Witches, Sky Man, The Raccoon Coat, Sun and the Big Eater, The Big Eater, The Star Husband, Grandfather's Two Families, Bluehorn's Nephews, The Twins Retrieve Red Star's Head, The Meteor Spirit and the Origin of Wampum, The Children of the Sun, Heną́ga and Star Girl, The Origins of the Milky Way, The Fall of the Stars; mentioning Rock Spirits: The Big Stone, The Green Man, The Creation of the World, The Commandments of Earthmaker, The Seer, The Roaster, The Raccoon Coat, The Medicine Rite Foundation Myth, Hare Secures the Creation Lodge, Baldheaded Warclub Origin Myth, Hare Kills Flint, Spear Shaft and Lacrosse, A Woman Turns into a Rock, Eats the Stinking Part of the Deer Ankle; relating to dogs or wolves: The Gray Wolf Origin Myth, A Man and His Three Dogs, White Wolf, Wolves and Humans, The Wolf Clan Origin Myth, The Old Man and His Four Dogs, Worúxega, The Dogs of the Chief's Son, The Dog that became a Panther, Baldheaded Warclub Origin Myth, The Wild Rose, The Man Whose Wife was Captured, The Resurrection of the Chief's Daughter, The Canine Warrior, The Dog Who Saved His Master, The Raccoon Coat, The Big Eater, Why Dogs Sniff One Another, The Healing Blessing, The Medicine Rite Foundation Myth, Trickster Loses His Meal, Sun and the Big Eater, Redhorn's Sons, Trickster, the Wolf, the Turtle, and the Meadow Lark, Hog's Adventures, Holy One and His Brother, The Messengers of Hare, Pete Dupeé and the Ghosts, Grandmother's Gifts, The Hočąk Migration Myth, Bladder and His Brothers, The Stench-Earth Medicine Origin Myth, The Old Man and the Giants, Rich Man, Boy, and Horse, Kunu's Warpath, Morning Star and His Friend, Chief Wave and the Big Drunk; Peace of Mind Regained (? ); mentioning coyotes: The Raccoon Coat, Spear Shaft and Lacrosse, Redhorn's Sons, Redhorn Contests the Giants, Trickster and the Eagle, mentioning otters: Otter Comes to the Medicine Rite, The Fleetfooted Man, The Dipper, The Two Children, Baldheaded Warclub Origin Myth, Spear Shaft and Lacrosse, Turtle's Warparty, The Origins of the Milky Way, Redhorn's Sons, Redhorn Contests the Giants, Kunu's Warpath, Įčorúšika and His Brothers, The Woman who Loved Her Half Brother, The Chief of the Heroka, The Animal Spirit Aids of the Medicine Rite, The Arrows of the Medicine Rite Men (v. 2), Holy Song II, Morning Star and His Friend, A Waterspirit Blesses Mąnį́xete’ų́ga; mentioning the Ocean Sea (Te Ją): Trickster's Adventures in the Ocean, Hare Retrieves a Stolen Scalp (v. 1), Otter Comes to the Medicine Rite, The Rounded Wood Origin Myth, The Baldheaded Warclub Origin Myth, Trickster and the Children, The Twins Retrieve Red Star's Head, Wears White Feather on His Head, White Wolf, How the Thunders Met the Nights (Mąznį’ąbᵋra), Bear Clan Origin Myth (vv. 2a, 3), Wolf Clan Origin Myth (v. 2), Redhorn's Sons, Grandfather's Two Families, Sun and the Big Eater, The Journey to Spiritland (v. 4), The Sons of Redhorn Find Their Father (sea), The Dipper (sea), The Thunderbird (a very wide river), The Twins Get into Hot Water (v. 1), Redhorn's Father, Trickster Concludes His Mission, Berdache Origin Myth, Thunder Cloud is Blessed, Morning Star and His Friend, How the Hills and Valleys were Formed. Themes: spirits come to earth in order to rescue humanity from enemies who threaten their existence: The Mission of the Five Sons of Earthmaker, Bladder and His Brothers, Baldheaded Warclub Origin Myth, Grandfather's Two Families, The Hare Cycle, The Hočągara Contest the Giants, The Medicine Rite Foundation Myth, The Raccoon Coat, Redhorn's Sons, The Redhorn Cycle, The Roaster, Spear Shaft and Lacrosse, The Spirit of Gambling, The Reincarnated Grizzly Bear, The Trickster Cycle, Redhorn's Father, Turtle and the Merchant; a large group of brothers (usually ten) live alone together: Sun and the Big Eater, The Big Eater, Įčorúšika and His Brothers, The Quail Hunter, Bladder and His Brothers, The Race for the Chief's Daughter, The Spotted Grizzly Man; a group (of brothers), a few at a time, go out looking for one of their number who is missing, but each searcher disappears in turn: Waruǧábᵉra, Bladder and His Brothers, Big Eagle Cave Mystery; a group of brothers disappear while following the tracks of a giant spirit animal: Bladder and His Brothers (raccoon); someone is abducted and led off into captivity: The Captive Boys, A Man's Revenge, Bluehorn's Nephews, The Lost Child, Wears White Feather on His Head, Įčorúšika and His Brothers, Bird Clan Origin Myth, The Man Whose Wife was Captured, Bladder and His Brothers, The Boy who was Captured by the Bad Thunderbirds, Bluehorn Rescues His Sister, The Boy who was Blessed by a Mountain Lion, The Green Man, Brave Man, The Chief of the Heroka, Šųgepaga, Hare Gets Swallowed, Hare Acquires His Arrows, The Raccoon Coat, Wolves and Humans, The Woman Who Became an Ant, Thunderbird and White Horse, Heną́ga and Star Girl, Brass and Red Bear Boy, Traveler and the Thunderbird War (v. 5), The Boy who Flew, Testing the Slave; the youngest offspring is superior: The Mission of the Five Sons of Earthmaker, Young Man Gambles Often, The Medicine Rite Foundation Myth, Twins Cycle, The Two Boys, Bluehorn's Nephews, The Children of the Sun, The Creation of the World (v. 12), The Race for the Chief's Daughter, Įčorúšika and His Brothers, The Raccoon Coat, How the Thunders Met the Nights, Eats the Stinking Part of the Deer Ankle, Sun and the Big Eater, Buffalo Clan Origin Myth, Bear Clan Origin Myth (vv. 4, 7), Snake Clan Origins, South Enters the Medicine Lodge, Snake Clan Origins, Thunderbird Clan Origin Myth; a small item set on or driven into the ground by a great man cannot be lifted by anyone else: The Twins Visit Their Father's Village (packs), The Shawnee Prophet and His Ascension (warclub), The Shawnee Prophet — What He Told the Hočągara (a warclub), The Raccoon Coat (a dog), The Roaster (a pack); in the course of his travels, a man enters a lodge where he finds a grandmother who helps him: The Seduction of Redhorn's Son, Ocean Duck, Waruǧábᵉra, Trickster Gets Pregnant, Trickster Soils the Princess; an inanimate object expands upon command: Kunu's Warpath, Baldheaded Warclub Origin Myth, The Raccoon Coat, The Elk's Skull, A Mink Tricks Trickster; inanimate things automatically respond to human commands: Spear Shaft and Lacrosse (corn plant), The Old Man and the Giants (boat), The Raccoon Coat (metal boat), Big Eagle Cave Mystery (canoe), The Sky Man (knots), Hare Retrieves a Stolen Scalp (everything), cf. How the Thunders Met the Nights (pontoon boat); striking an object to make it move faster in the water: Ocean Duck (a Waterspirit); one small morsel of food when put in a kettle becomes sufficient to feed everyone present: Redhorn's Father (bean), Ocean Duck (bean), The Chief of the Heroka (deer tail), The Red Man (deer tail), The Raccoon Coat (kernel of corn); a prisoner escapes by killing (some of) his captor(s): Wears White Feather on His Head, Įčorúšika and His Brothers, Hare Acquires His Arrows, Thunderbird and White Horse, The Boy who Flew, Hare Gets Swallowed, The Raccoon Coat, The Captive Boys; Coyote abuses someone: The Raccoon Coat. 1 Paul Radin, "Wodjidjé," Winnebago Notebooks (Philadelphia: American Philosophical Society) Notebook #62: 1-50. 2 Mary Carolyn Marino, A Dictionary of Winnebago: An Analysis and Reference Grammar of the Radin Lexical File (Ph.D. Thesis, University of California, Berkeley, December 14, 1968 [69-14,947]): 421, sv wi, "sun"; 211, sv djidje, "to stand, to become"; 211, sv wodjidjé, "meteor."